I don't know about you but in The Bay the weather is confused right now. In a way, I think it's having a spring-fall identity crisis. For example the high today is 73 degrees. Excuse me weather but it's October and I want to wear all of my fabulous fall clothes. With that said, I am still in transition mode. Because of the cold mornings and warm afternoons, I am having to wear a lot of layers. I am also trying to infuse a little fall while at the same time acknowledging the spring-like weather. My remedy? A cream blazer to spring it up and some fall hints to bring it all together. 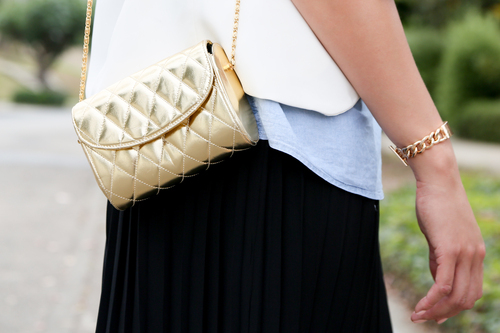 I absolutely love this pleated skirt from target. I got it from the clearance rack last season. It also has a fab faux leather detail at the waist that is perfect for this season. For fall and winter I am going to pair it with a camel turtleneck, tights and boots. The tall cambray shirt from Gap is the perfect piece for any season. You can roll up the sleeves or wear them down (yes, they are long enough for us), layer it or wear it on it's own. It's a must have staple for our closets. One of my favorite pieces to rock is a 3/4 sleeve blazer and this cream baby is perfect for transitional outfits. Crispy, clean and effortless. The shoes, THE SHOES! You know I love a good Payless pick-up and I almost passed out at my computer when I saw these (yes, I know I am dramatic). Color blocking, animal print, up to size 13...need I say more? You get tall girl points Christian! Let me know if you want me to test some shoes for you (or ya know, just rock every pair that you make). I am totally down. What fits are you feeling this October?